When you have water damage, immediate response is crucial. Call H2o Dryout to remove the water quickly, we use advanced drying equipment; our highly IICRC certified skilled technicians will assess the extent of damage and remove the water quickly. Our technicians closely monitor and document and photograph the drying process. We will verify when the property is completely dry. Turn your water supply off to the home, if you are not sure where the water is coming from. Be safe; if water is entering any of your outlets shut your breaker off. Please do not use your house hold vacuum to extract water. Be careful of slips and falls, wet materials can be very heavy, use caution when lifting. If you have wet ceilings that are sagging, stay out of the room. After the flood water has been cleaned up and the drying equipment is in place. 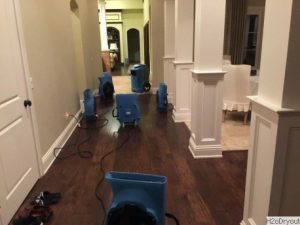 We will help you with your insurance claim, we are a direct insurance billing water damage Cleanup Company with 20+ years experience in the insurance industry.